It’s a simple premise: a student arrives on a street corner in the early morning. Within 15 minutes, a bus arrives and transports the student to school. In the afternoon, the same bus drops the student off at the same street corner. What goes unseen is the amount of preparation, care, and commitment exhibited by each bus’s driver. Hours before students arrive at each stop or prepare to leave school, bus drivers and monitors throughout the country assure the bus is in working order, clean, and welcoming. Drivers and monitors learn the names of students, and make an effort to know them better. They know, like many don’t, that the school day ends and begins long before and after the bell rings. 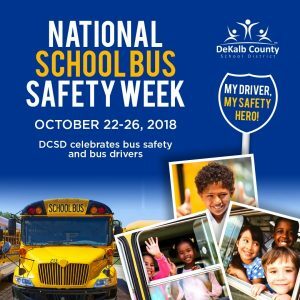 Throughout the week of October 22, DeKalb County School District (DCSD) honored bus drivers and monitors through onsite celebrations, gifts, and recognition as part of National School Bus Safety Week. The weeklong event kicked off on October 22 with a rally at Stone Mountain Middle School that included a catered breakfast for bus workers as well as one-on-one conversations with district officials. Dr. Green urged all district stakeholders to use National School Bus Safety Week as an opportunity to pledge themselves to promoting school bus safety and to not take it for granted. In addition to being welcomed by Dr. Green as well as a marching band, bus drivers were also read poems by Stone Mountain Middle students Kaylee Ash, Saana Louis and Orrin Marshman. “You always brave the weather to get our kids safely where they need to be while being a shining example as you do it,” Ash read. “I am not a teacher, but you can learn from me. I am not a taxi, but can get you where you need to go. I am not a counselor, but I will listen to you when you’re sad. I’m not your mother, but will care for you. I’m not a nurse, but will help your pain. I’m not a police officer, but I will protect you. I am a bus driver,” Marshman’s poem reads. 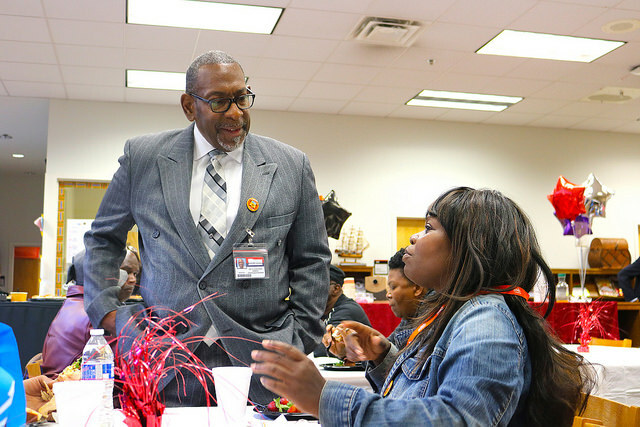 According to Stone Mountain Middle principal Vincent Hinton and assistant principal Marcos Whyte, bus drivers make the duties of being building administrators easier due to bus driver reliability and overall commitment to students. The duo individually honored 42 bus drivers and monitors present at the rally by presenting them official certificates of recognition. For more information on National School Bus Safety week, visit the National Association for Pupil Transportation website. Click the link below for pictures from the event at Stone Mountain Middle, DeKalb Alternative School, and other events during the week.